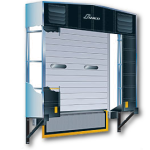 Serco Dock Shelters help keep the elements out while providing full, unimpeded trailer access for a safe and productive loading dock. Best of all, our shelters feature ultra-durable Serco Steel™ framing for years of like-new performance. The Serco Rigid Steel Frame Dock Shelter is manufactured with galvanized steel framing, providing improved durability and consistency over wood framing. The S-420 can accommodate a wide variety of trailer sizes while providing full, unimpeded access to the back of the trailer. Frame covered with translucent fiberglass allows natural light to enter the dock area. 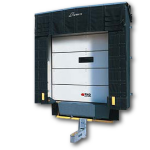 The Serco Ultra Dock Shelter creates a tight seal between the building wall and the back of the truck. It effectively keeps the outside elements out of the warehouse, providing energy savings and added comfort for your employees. The compressible foam side frame prevents damage from off-centered trailers. Roll-formed galvanized steel framing (5-year warranty). 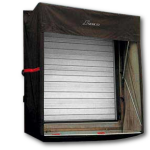 The SnapBack Shelter is designed to service a wide variety of trailer sizes & types, while providing full trailer access during the loading process. A flexible frame yields to misguided trailers, preventing costly damage. Flexible fiberglass stays ensure that head and side curtain pressure is maintained on the truck body while compressible neoprene cords conform to the vehicle. Rail Shelters protect products and goods from the elements during the transition between the loading dock and railway cars. Rail shelters are suspended on a steel frame and equipped with steel extension arms, allowing them to cover distances up to 72″ between docks and rail cars.